From the Schomburg Center online exhibition, Harlem 1900-1940: An African American Community. This photo depicts young Black writers and intellectuals gathered at the Harlem Home of Regina Andrews and Ethel Ray Nance. 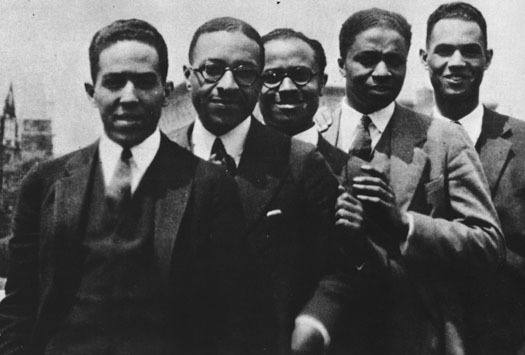 The group, photographed at a party held for Langston Hughes, includes (from left to right): Poet Langston Hughes, sociologist Charles Spurgeon Johnson, historian E. Franklin Frazier, doctor and author Rudolph Fisher, and legislator Hubert Delaney. This photo is from the collection of Regina Andrews. I love your site. You’ve been added to my blogroll and I presented you with the Arte y Pico Award(read my post 6/28/08). Thanks for posting this picture. It’s always refreshing to see intelligent black folks who are doing the right thing. I’m with HG! I love your blog! Since I’ve been in HE for over 30 years, I always feel right at home here! Got something for you over at SjP’s. Thank you so much for the add, and for the Arte Y Pico Award. My blog is truly a labor of love, and it feels great when something I am truly passionate about strikes a chord with others! Thanks for your words. I’m so glad this feels like a welcoming place. I’ll drop over by your place to check out what’s happening there!